What's up with Yik Yak? Yakety Yak: What’s Up With Yik Yak? I first wrote about Yik Yak back in March, when the app took several suburban schools by storm. High school administrators around Chicago were deluged with incidents stemming from inappropriate student use of this app, ranging from bullying to bomb threats. To their credit, the administrators of the app responded quickly and restricted its use in and around most middle and high schools. Of course this didn’t stop persistent and inquisitive teens from using the app in other spaces, but it was a start. Since then, the app has slowly made its way to other parts of the country, including mine. When I downloaded the app back in March, no one within 10 miles of me was using it. I re-checked sporadically over the summer, but there was still no action. When I traveled to speak in different parts of the country, I would load the app to assess its popularity, but usually there weren’t any active posts. In the last couple of weeks, however, the app has really caught on at my University. The local NBC affiliate in town called me last week to ask if I had ever heard of it. I pulled up the app and saw that there was quite a bit of traffic. The topics were about what you would expect from a college-aged audience: alcohol, exams, and relationships. Overall, though, I was pleasantly surprised at how relatively tame the posts were. There was nothing that you wouldn’t expect college students to be talking about while hanging out with their friends. There was no bullying or harassment or “Juicy Campus”-type disclosures about the sexual impropriety of certain students. Crass comments were generally downvoted – a clear statement by users that those kinds of posts are not welcome. I assume this varies by location, but the Yik Yak community in my area seem capable of self-regulation. To be clear, this isn’t an app that is appropriate for most adolescents. Keeping it out of their hands, however, may prove challenging. If college students are using it, high schoolers will want to as well. And if high schoolers like it, eventually middle schoolers will be drawn to it. Because of this, we need to educate youth about the reality of these kinds of “anonymous” apps. First and foremost is that their posts are not really anonymous. The app knows the device that the posts are coming from, and if necessary the police can track comments of a criminal nature back to the user. It is also important to recognize that users may be inclined to say things in these environments that they wouldn’t say to someone face-to-face. Hurtful, demeaning, or generally inappropriate posts can have real-world consequences—whether the original poster sees them or not. Larry Magid and Anne Collier over at ConnectSafely just posted some tips for the safe use of apps like Yik Yak. In addition, like many games and other social media spaces, this app can be addictive. When creative or humorous posts are upvoted by others, it increase ones “Yakarma.” Similar to likes, shares, and re-tweets, these upvotes are seductive and highly sought-after. When I posted something that I thought was kind of funny, I found myself refreshing the app every few minutes to see how the community would respond. I also wanted to see what funny comments my students were capable of. 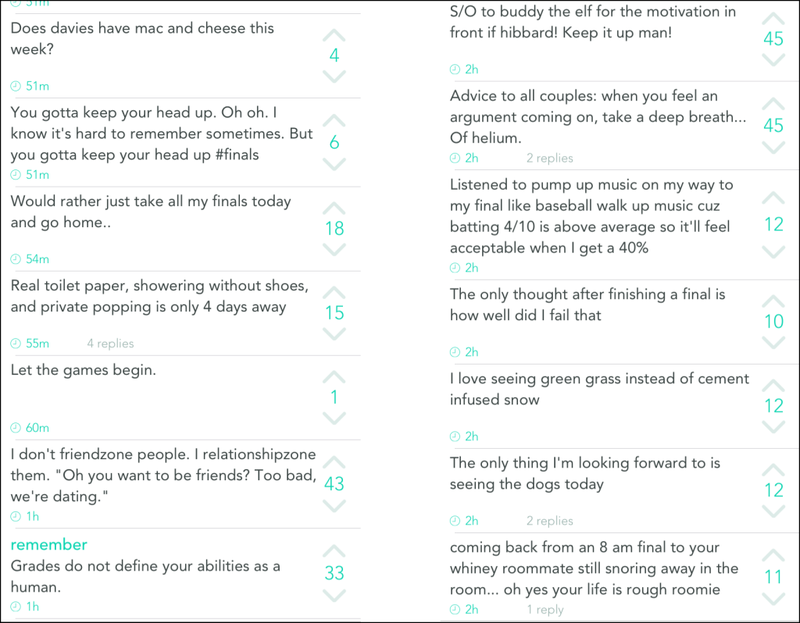 As it is final exam week on my campus, many posts played on the fact that students are struggling with the realities of college life during this stressful time: “Check out my new mixtape…it’s my GPA and it drops tonight.” Quite a few students actually lamented the fact that they stumbled upon Yik Yak during finals week. Who’s Responsible for the Proliferation of These Apps? Anonymous and ephemeral apps (those where the content of posts seemingly disappears after a period of time) are all the rage these days. They are cropping up like Whack-A-Mole as parents and educators desperately try to keep up. People regularly ask me what legitimate purpose these apps serve. I just remind them that they wouldn’t be developed if there wasn’t a market for them. For one, teens have been listening to adults who have warned them for years about the potential permanence of their digital footprint (digital tattoo, really), and they are looking for ways to interact with others without the stress of having to worry about how a future employer or mother-in-law might judge them based on previous online indiscretions. Apps like Yik Yak, Ask.fm, Snapchat, and numerous others, can fill this role. Plus, I don’t think it is necessarily fair to put the blame exclusively on the app (or the company that created the app). For example, should we blame Daniel Tosh for telling a crude joke on TV, or Comedy Central for broadcasting his show, or me for watching it? When it comes to Yik Yak and others like it, should we blame the app, the poster, or the consumer of the content? If nobody watched Tosh.0, Comedy Central would cease to air the show. If nobody downloaded or posted to Yik Yak, it would disappear very quickly. Whether we like it or not, apps like these are here to stay. And we all have an obligation when it comes to policing them. Parents need to ensure that their kids are only interacting in age-appropriate environments. They should also take the time to explain the concerns that they have about particular social media spaces, and equip their kids with information that they can use to understand the potential consequences of misbehavior (even in places that are promoted as private or anonymous). It is best if parents focus more on the behaviors they are attempting to prevent rather than the online environments in which they could take place. The environments will change, but the behaviors generally don’t. Social media administrators need to work to cultivate a community where members look after one another and not target each other with hate or humiliation. Posts that violate commonly-accepted norms or site-specific terms of service—including bullying—need to be removed immediately, and repeat violators need to have their accounts suspended. Yik Yak is clear in its rules that it will not tolerate bullying. And it appears as though they are doing their best to maintain this standard. We’ll see if they can keep up as the yakking increases. I Like how you gathered all this information and put it into this blog. Also I liked all the tips of cyberbulling. Are “Gamers” More Likely to be “Bullies”?